Move over, corn mazes, hello Script Ohio. Agricultural engineers at the Ohio State University's College of Food, Agricultural and Environmental Sciences demonstrated the power of precision agriculture technology this growing season by turning a 100-acre field near the Molly Caren Agricultural Center near London into the world's largest version of "The Incomparable Script Ohio." Experts in the Department of Food, Agricultural and Biological Engineering typically use "smart planting" devices guided by GPS to help farmers grow corn and soybeans more efficiently, using fewer crop inputs and fuel to plant and harvest their crops. Those experts have also spent the past four years demonstrating the efficacy of the technology by crafting a series of aerial pictures in a given field, including a simple Block O in 2015, Brutus Buckeye in 2016, and the Athletic Department's version of the Block O logo in 2017. This year, the project took on a much grander scale. "We decided to start and continue this project to show the potential of new multi-hybrid/variety planting technology and demonstrate that it can complete tasks with accuracy and precision to the point of making logos in field scenes,” said Andrew Klopfenstein, a senior research associate engineer. The Script Ohio was created using components from Precision Planting that turn a traditional planter into a “smart planter.” From a monitor inside the tractor, farmers can control the plant population and see hybrid type planted in coordination with a mapping of GPS coordinates. To put the size of the soybean Script Ohio into perspective, according to the College, if The Ohio State University Marching Band lined up in the dot of the I, they would measure just 20 feet wider. “This year’s design was slightly more difficult than some of the previous years because it was a single continuous piece with more curves than we had attempted in the past,” said Ryan Tietje, a research associate and graduate student who designed the past two field demonstrations. 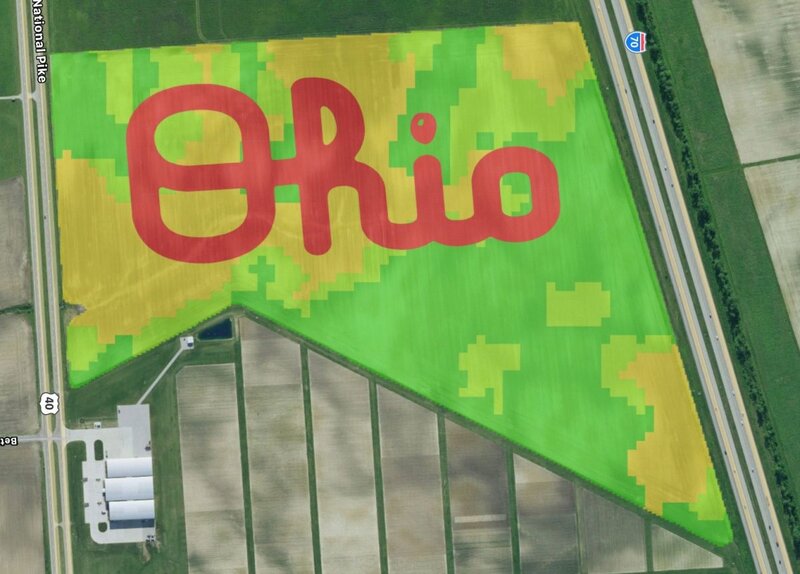 Tietje explained that the design was created due to a difference in soybean maturity between the two precision "prescriptions," giving the field its distinctive color variation between the more mature and yellowing Script Ohio, versus the rest of the healthy green field. Programming a "prescription" for planting soybeans of different maturities allowed Ohio State ag engineers to create the world's largest Script Ohio. Photo: The Ohio State University College of Food, Agricultural and Environmental Sciences. By creating a map using GPS coordinates, a grower can program their planter to distribute less seed to an area with rocky terrain with an expected lower yield as opposed to an area rich in organic matter where higher plant populations will increase productivity. Ohio State's Molly Caren Ag Center is a 2100-acre facility that is home to the Farm Science Review each September. The facility has a 67-acre conservation area with an all-season cabin for agriculture and natural resource meetings. Along with the FSR and conservation area, there are 1400 acres of production agriculture of corn, soybeans and wheat.